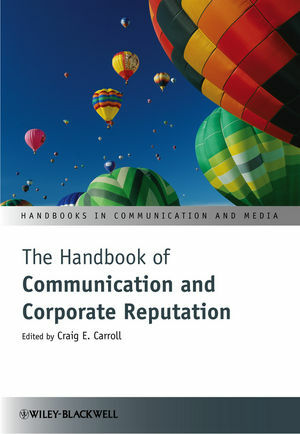 With the latest insights from the world of communication studies into the nature of corporate reputation, this new addition to Wiley-Blackwell’s series of handbooks on communication and media reflects the growing visibility of large businesses’ ethical profiles, and tracks the benefits that positive public attitudes can bring. Craig E. Carroll is Visiting Scholar in Corporate Communication at New York University’s Stern School of Business and Senior Research Fellow with the Reputation Institute, LLC. He serves on the adjunct faculty at the IE Communication School in Madrid, Spain and USI Università della Svizzera italiana in Lugano, Italy. He is Past Chair of the International Communication Association’s (ICA) Public Relations division. He is editor of Corporate Reputation and the News Media, and serves on the editorial boards for Corporate Communication, Corporate Reputation Review, Journal of Communication, Journal of Public Relations Research, Public Relations Journal, Public Relations Inquiry, and Public Relations Review. His research on corporate reputation has been presented in over 15 countries.